Newsletters have spawned a communications revolution. Today, anyone with a computer can produce a well-designed newsletter and open a new, economical, and effective avenue for informing customers, employees, and associates. 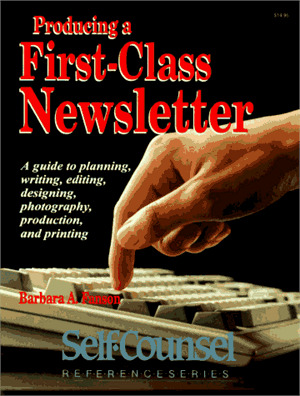 Barbara A. Fanson, an award-winning newsletter publisher, demonstrates how to plan, write, and produce a professional-quality newsletter that's sure to keep readers interested. Advice is given on page layout, production schedules, editing, and typesetting. Also included in Producing a First-Class Newsletter are valuable suggestions on article writing, design, getting the most out of photos and graphics, and working with a printer to ensure the newsletter is exactly the way you want it. Barbara A. Fanson has worked in the graphic arts industry since 1978 as a desktop publisher, graphic designer, editor, typographer, assembly artist, and advertising consultant. Barbara’s business, Sterling Education Center, specializes in computer training in graphic software programs and design.